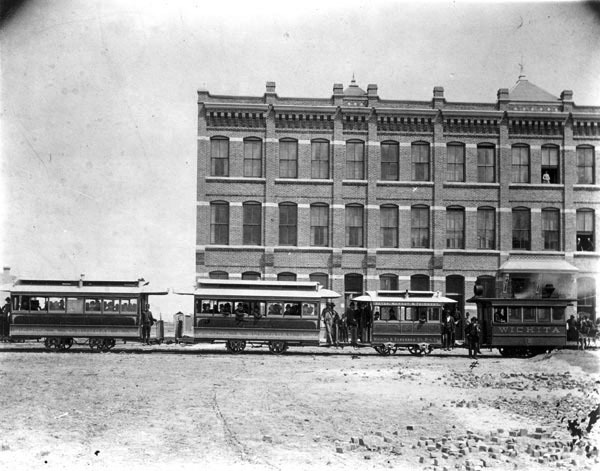 Description: The Wichita and Suburban Street Railway cars in front of the Stock Yards Hotel. It was located at 18th and Emporia. Keywords: Transportation, business and industry. Description: Looking south at two businesses, southwest corner of Douglas and Sycamore. 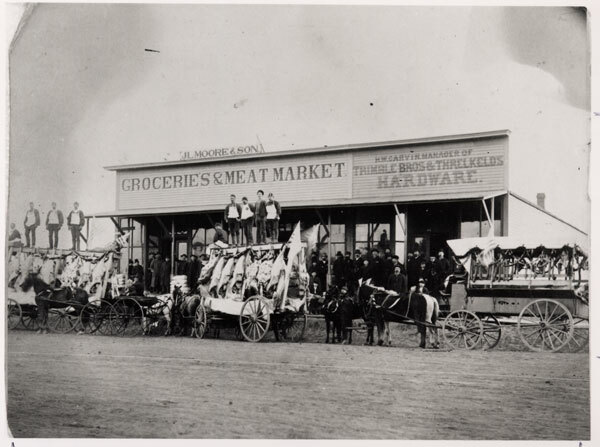 Signs indicate J. L. Moore & Son, Groceries & Meat Market and Trimble Bros & Threlkeld's Hardware. Horse-drawn wagons are decked with American flags as if for a parade. Keywords: Wichita, agriculture, business and industry, people, public events, transportation. Description: Downtown Wichita view showing Douglas Avenue. 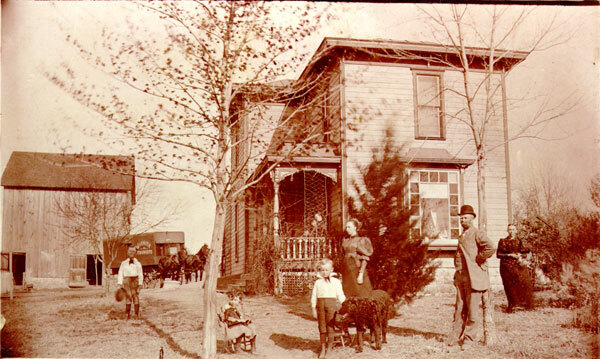 Photograph was taken June 1, 1887, probably from nearly completed Carey Hotel (Eaton Hotel), southwest corner of Douglas Avenue and St. Francis Street. In first block west of Carey Hotel, Richland building at 405 East Douglas Avenue is under construction. 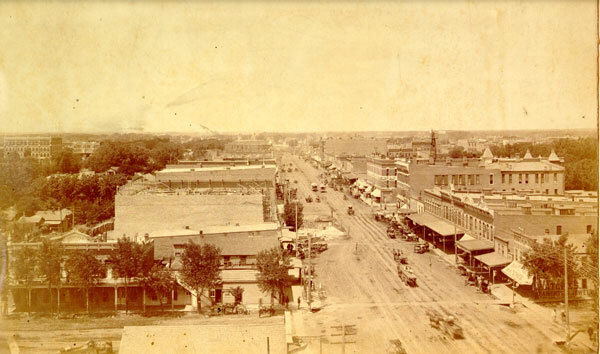 Keywords: Wichita, street scenes, business and industry, transportation, construction, trolleys, wagons, buggies. 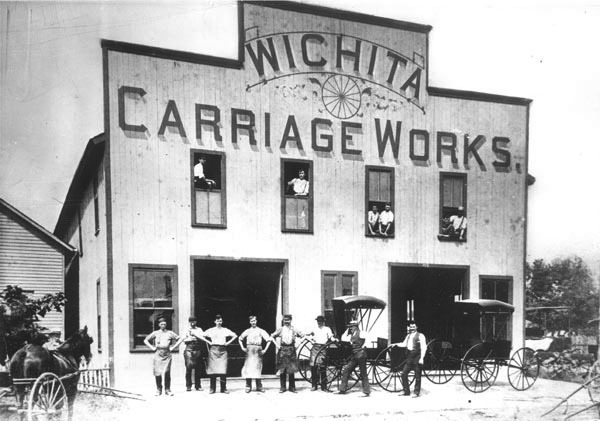 Description: Wichita Carriage Works, located at 157-9 North Water, M. A. McKenzie, proprietor. Keywords: Transportation, people, buggy, false fronts, commercial building. 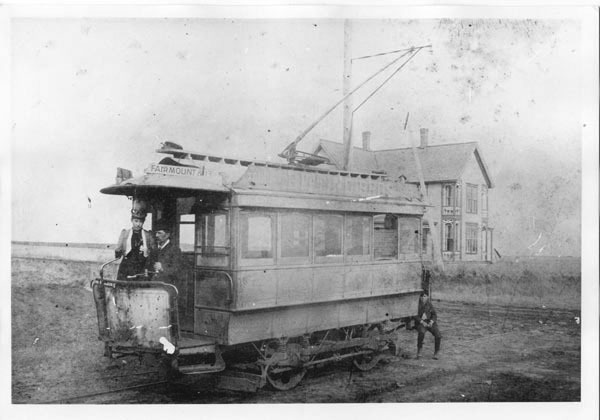 Description: Fairmount and 13th Street trolley car on "honeymoon trip"; passengers are Charles Limbarger and wife; house in background belonged to President Morrison of Fairmount College; house was on 12th Street and streetcar tracks did not go as far as 13th yet. Keywords: Wichita, transportation, people, residences, Wichita Electric Street Railway Company, Riverside and Suburban, trolley car, streetcar, street railroad, Fairmount College, Charles Limbarger, Mrs. Limbarger, honeymoon. 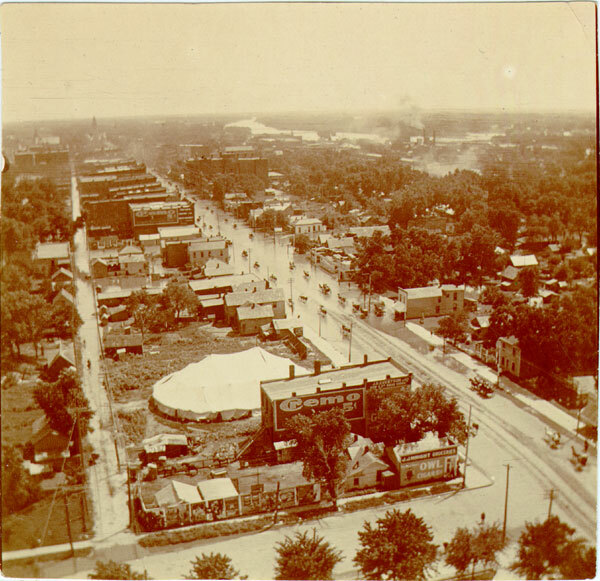 Description: View of a flood looking southwest from Sedgwick County courthouse showing Main Street in June 1894. Keywords: Wichita, street scenes, transportation, rivers, floods, horses, buggies, Arkansas River. 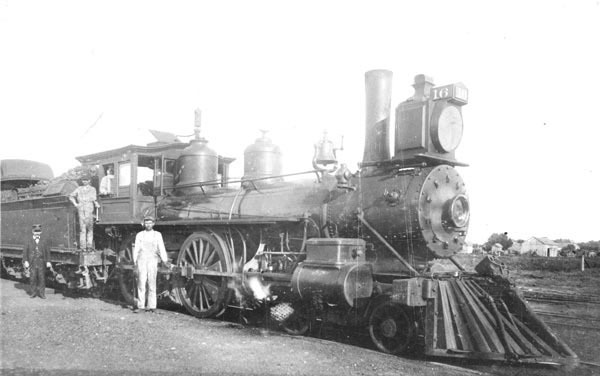 Description: Missouri Pacific Engine No. 16 Coal Fired Train. The train went from Wichita to Yates Center. Keywords: Transportation, train, engine, people. 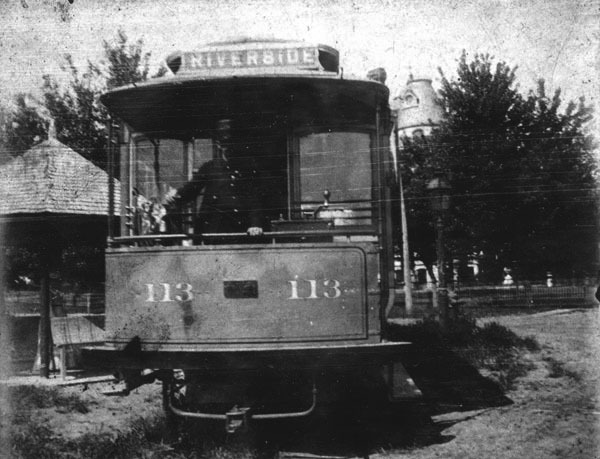 Description: Riverside Streetcar at the Circle Drive turnaround in College Hill. 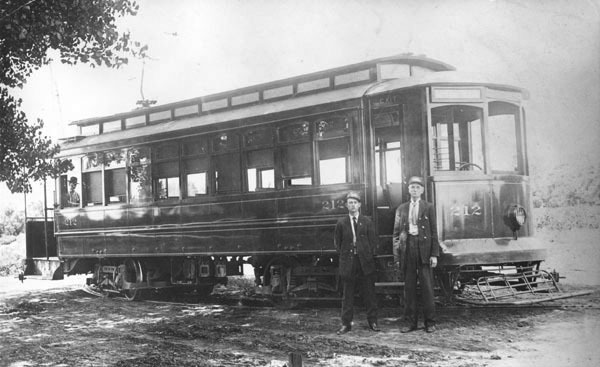 Description: South Main double-truck Streetcar #212.